Hip Replacement Surgery- Final Update. This morning I went for my final (well, for the short term) follow up appointment with the surgeon who replaced my hips. Having inspected how I was walking and how I can control the new joints, no x-ray was needed, but he says I can now go crutch-free! Hooray! This is the first time in well over a decade that a ‘no crutches’ life has been an option for me, I’m thrilled. Obviously with my ‘push the limits’ attitude, I had to ask what I can do safely with these new hips… He suggested swimming, I suggested jet skiing, he suggested riding a bike, I suggested riding a horse – or a camel! After some discussion about what the hip implants I’ve now got can actually take, we settled on how I will try things I want to try, but be sensible about it- no trampolining for me then! This is all so exciting though, it means I can finally try a few things I’ve always wanted to but in the past have been unable to due to the pain. I cannot wait to try some new things with my shiny new hips! 🙂 Starting tomorrow. I may well be joining a gym! Wooooo! It’s a pretty positive outcome for what was a nasty situation just a year ago. I was in excruciating pain on a daily basis, now I am pain free! The decision to have these joints replaced now (even though I’m aware they’ll need doing again in the future because I am so young at the moment) was the best decision of my life. 6 weeks, 1 crutch, 2 hips, 1 big smile! Hip 2: One Month On. 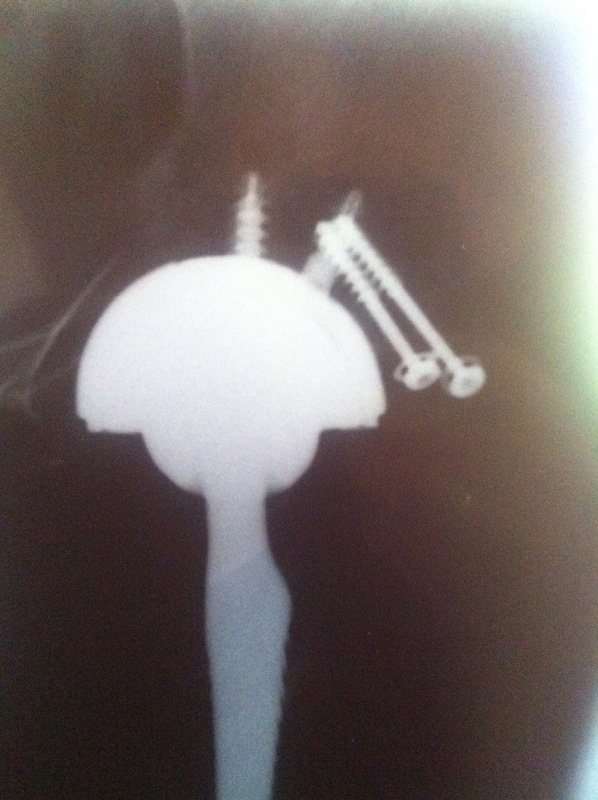 One month ago today, my new left hip was put in it’s new home. Today, it is very happy to be there and is eager to do its job and get on with life. I’m really happy with it. I can now drive, lay on my side at night, put my socks on myself (!) and am getting about quite easily on crutches. 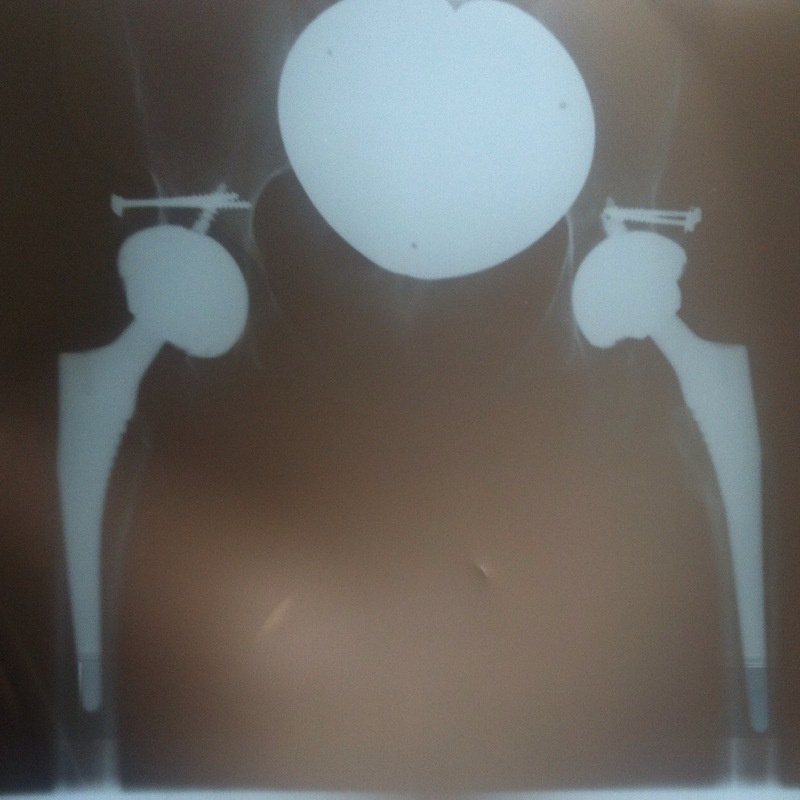 I keep accidentally putting more weight than I should through the new hip- because it feels so strong and ready I think- but am trying to stick by the rules until I know the bone graft is all fine when I go for an x-ray in 11 days. Hopefully not too long to go before I can begin to get off these crutches and possibly commence the first crutch-free phase of my adult life! 🙂 Will update once I’ve had the next appointment. It’s been 2 weeks and 2 days since I had my second hip replacement, and I thought I’d give a little update on the situation. No painkillers being taken. No pain being felt. I can get my own socks on (quite a challenge when you can’t bend in the usual ways!). I can get about with relative ease on crutches. I’ve been told I am allowed to drive again (I have an automatic car, it’s my left hip, and I just had to ask the surgeon for permission even though I should be waiting til 6 weeks post op! My usual impatience with recovery shining through there!). Today, I’ll be taking the hired wheelchair back, having had it sitting being completely unused. … What I’m saying is, is that this recovery is going really well. My legs certainly seem to be back to matching lengths now, the scar is neat despite being over two scars from previous surgery (I’ll post a pic once the steri strips are off tomorrow) and all the achey pains from before are gone! Very happy. I’m eager to get to the point where the bone graft has solidified and I can begin to get off these crutches, but I know I must be patient with that bit as there is no point causing damage by rushing it…. But for now, things are going well. The surgery went well, as my surgeon did a fantastic job of getting the implant in without having to break and straighten my femur to do so. The pain was under control for almost all of my stay in hospital, and I was able to get up out of bed and walk a little two days post surgery. I’m now at home, relying on just paracetamol to keep the pain at bay, learning how to get about with two legs which are now back to being matching length! It does seem bizarre having spent four months with a 2 inch length discrepancy, but wow am I pleased this surgery is over. 🙂 I feel like I’m at the beginning of a recovery period which will lead me back to living my life how I’d like to- pain free for a while! With a planned recovery of three months long term (using crutches) I should be crutch free for the first time in years (13? 14 years?) in time for my 23rd birthday…. And that excites me. Finally I can get on with the things I want to focus on, and not what my body dictates I must! Ta-dah! Reveal of the Scar! Last week, the stitches were removed from the hip replacement wound (not a pleasant experience), but more dressings were put on to protect it for a little longer. Today, I’ve been to see the nurse again (who told me my scar is ‘beautiful’ haha) and all is well, so now the scar is free to breathe fresh air, and to be looked at properly. Well, exactly a week ago, I was in the cinema trying to distract myself from the fact I was going in for hip replacement surgery the next morning. This evening, I am sitting at home, watching television with less pain in my hip than I had before surgery! The hip surgery itself seems to have gone really REALLY well and I am so happy! Unfortunately, my cornea got scratched during surgery and at the moment, my sight is ever so slightly blurred in that eye at the moment, and I did have one day in hospital where I experienced extreme pain due to the epidural being switched off at a high level rather than being reduced first, but despite these set backs, I was allowed out yesterday afternoon. (6 days after surgery). I am quite happily getting about with my crutches and one shoe on indoors, and getting by on only 2 or 4 paracetamol throughout the day to keep any pain at bay… Never been happier after an operation. So, so far, so happy! Can’t bend my leg certain ways, and have been instructed to sit in a less than ladylike manner for a few weeks, but that is absolutely fine by me for what I’ve received as a results of this surgery. Stitches out next Monday (when I will post again, as no doubt the scar isn’t going to be a thing of beauty and I’ll feel the need to describe it in my usual manner, 😉 ) but my next challenge is to get myself to London (in the passenger seat of a car, I’m not stupid enough to attempt the tube just yet!) to see ‘A Midsummer Night’s Dream’… Onwards and upwards, til the next surgery (which someone mentioned ‘before Christmas’ about, but that’s for a discussion another time).